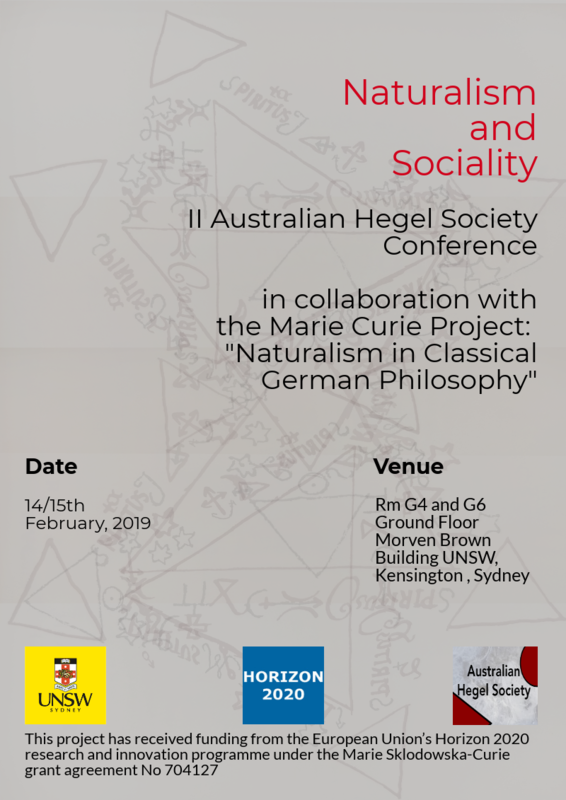 We are glad to announce that the Australian Hegel Society in collaboration with the Marie Curie Project ‘Naturalism in Classical German Philosophy’ will hold the conference Naturalism and Sociality. The conference will take place at the University of New South Wales Sydney, on February 14th-15th, 2019. This conference has received funding from the European Union’s Horizon 2020 research and innovation programme under the Marie Sklodowska-Curie agreement No 704127. The conference is hosted by UNSW Sydney, School of Humanities and Languages. Information about traveling to the campus: https://www.futurestudents.unsw.edu.au/getting-unsw. Free admission, but if you plan to attend, please notify AHS by email for catering purposes at theaustralianhegelsociety@gmail.com.